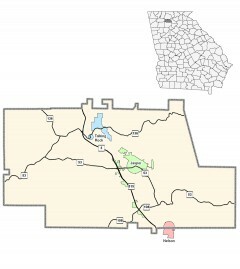 Pickens County was created in 1853 from parts of Cherokee and Gilmer counties. Georgia’s 100th county was named for General Andrew Pickens, a Revolutionary War soldier. A railroad line built in 1883 from Atlanta, through the valleys and mountain passes of Pickens County to Tate and Nelson, made possible the development of large marble quarries. One of the largest marble veins in the world is in Pickens County, running at least four miles long. It is a half-mile deep and almost that wide in places. Over 60 percent of the monuments in Washington, D.C. are made from Pickens County marble.